I have my July favorites on the way, things have been crazy at work, which depending on how you view it can either be good or bad. Either way, I finally got a new cell phone, and of course after getting one, I discovered that the back casing of my old one, had begun to melt apparently. Shock shock! Besides that though, I purchased another one of the Gumdrops from Nicole by OPI. This one was the one I had been debating between when it came to Candy is Dandy. Cinna-man of My Dreams is an unique color (to me at least, I don't have anything like it in my collection!). It is a brick red-pink that has shades of mauve, brown, and light pink. The glitter is basically the main part of the texture, there's no hologram glitters or hexagon glitters either. This is the best way to describe the color. Vivid setting on the camera. Application: Easy. Two coats for this and it was completely opaque. Actually, when you apply one coat, you get the true color of the polish, I think. I actually like how one coat looks, two coats makes it perfect for fall. Overall Verdict: I absolutely adore this color. Both one coat and two coats. To me it's a unique color, and doesn't match anything I have. Definitely happy that I went back and got this color. Price: Varies, I purchased this for $6.94, but the price can go up to $8.00. 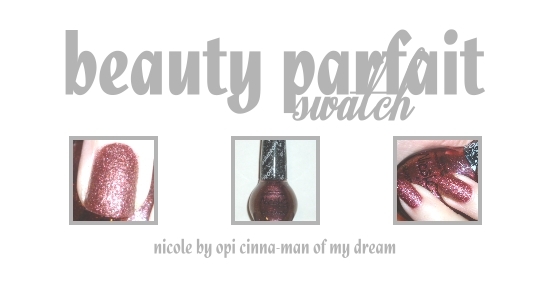 Availability: Anywhere that Nicole by OPI is sold. That's really pretty and unique! I liked this one much more than the rest of the Gumdrops, they just weren't that appealing (from the swatches I saw anyway).